If showing houses were this easy, no one in real estate would need a landing page. But it ain’t. Image source. Do a Google search for the name of your city + “real estate.” Click on a few of the sponsored ads. Did you find a landing page? Chances are you didn’t, because most real estate agents have not yet caught on to the fact that they need to be sending their paid traffic to dedicated landing pages. If you’re a real estate agent, a broker, realtor or even an agency working on behalf of any of these people, this represents an awesome opportunity for you to stand out from your competition, establish trust and collect a lot more leads. A few weeks back we held a landing page design competition with our friends over at ThemeForest and got more than 100 submissions in 18 categories. Here are five outstanding real estate landing page templates that anyone can use to give their business that extra edge over the competition. We’ll break down what’s great about them, and how you can use them to make your marketing more successful. This real estate template comes in two styles: click-through and lead generation. You can use the click-through template (pictured) for showing off specific properties. Give readers a taste of the houses you’re selling along with a description. The lead generation template has a form for potential buyers to fill in their information right at the top of the page. This one would be most useful for real estate agents who want to offer prospects a quote or give their visitors information about the service they offer. This information could come in the form of an ebook about how to purchase real estate, a guide to city neighborhoods, or any other content that might be of value to potential homeowners. The idea here is to get your customers to empathize and place themselves in a scenario where they are using it. In this case, “it” refers to the house you’re selling. 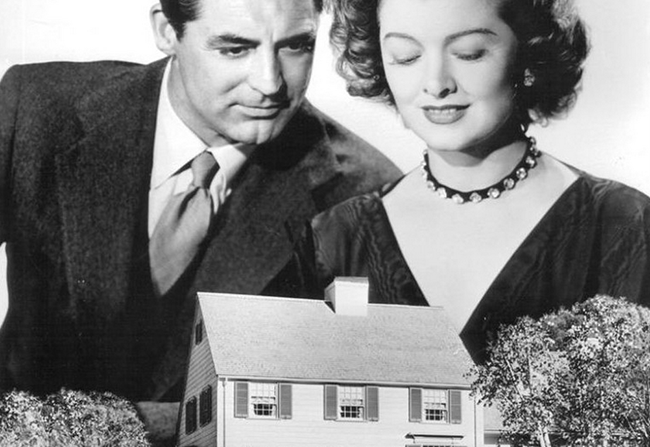 On a real estate landing page, that image might be a happy couple in front of a house, a family playing in the backyard, or some folks relaxing on a porch. Whatever you choose, it should help people imagine themselves living in that house. This page uses conversion centered design, and includes a feature that will be of particular interest to real estate agents — the video section. Videos increase the length of time people stay on your page, giving your message more time to sink in. And if you feature yourself or company employees in the video, it gives prospects the opportunity to get to know you better. There’s a reason real estate agents put their face on “for sale” signs; people are more likely to buy from people that they know and trust. Video can be used to address buyer modalities. These are profiles that describe different buyer behaviors. As CRO extraordinaire (and friend of Unbounce) Angie Schottmuller explains, different buyers require different amounts of information. Video appeals to buyers who need more information and visuals. If you’re using multiple advertising channels (AdWords, Facebook, Bing, etc), be sure to A/B test a page with video versus one without. This will help you to establish which of those channels is most receptive to video. Use video to appeal to landing page visitors who want more information! I love this lead generation page. It reminds me a bit of the benches or billboards that you see with pictures of real estate agents’ bright, smiling faces. Except that this page has a form where folks can immediately send you their information so that you can get in touch with them. A real estate agent could, for example, offer a free consultation to potential customers on this page. As a real estate agent, you know the importance of selling yourself to potential clients before you sell a house, and this landing page template offers the opportunity for you to really let your personality shine through. This is a landing page that would work well for someone selling multiple properties in a new suburban development, for example. From top to bottom, each section gives you the opportunity to show off features of the community that set it apart from others, and the different types of dwellings one might find there. The map next to the icons that display the amenities in the immediate area is a great touch, as well. It gives your readers a sense of the neighborhood, and may very well generate further interest in the property. The other thing this page has going for it is contrast. Notice the use of whitespace, which gives the page plenty of room to breathe. This breaks up the page and draws the eye from one section to the next, allowing you to present your message in nice, bite-sized pieces. Whitespace on a landing page gives content *and* visitors room to breathe. Most people would use their mobile device to do at least one of the following: search for listings, find directions to a house, look for more information on a listing, call or e-mail an agent directly, or watch a video while out looking for a home. Like the others in this category, this page is mobile responsive. But this page has something that might help readers keep scrolling when they first arrive on their mobile device. The arrow that points towards the form at the right of the page is a great directional cue that helps draw attention to your form. When designing for mobile, you could take that arrow and point it downward instead. This would give your readers the impetus to keep on scrolling down the page to get all the information they need to convert. Little touches like this can go a long way towards capturing leads on mobile, so make sure to make the most of them (and test them too)! There are more than 170 Unbounce landing page templates on ThemeForest, so if you can’t find what you’re looking for when browsing our free Unbounce landing page templates, make sure to get over there and take a look. And don’t be afraid to get your hands dirty with some A/B testing. 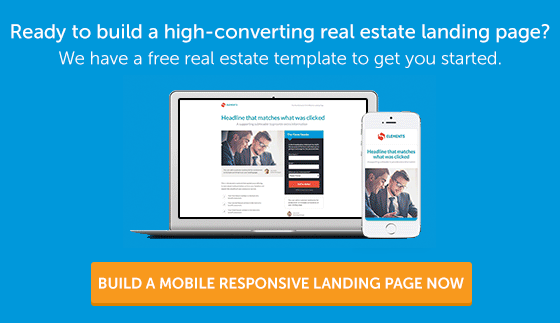 The most important thing you can do when using landing pages for real estate marketing campaigns is to test variations to make sure that you’re reaching your audience in the right way. You never know what might make the difference between a page that sends you qualified leads, and one that gets ignored. Be sure to test, test, and then test again!